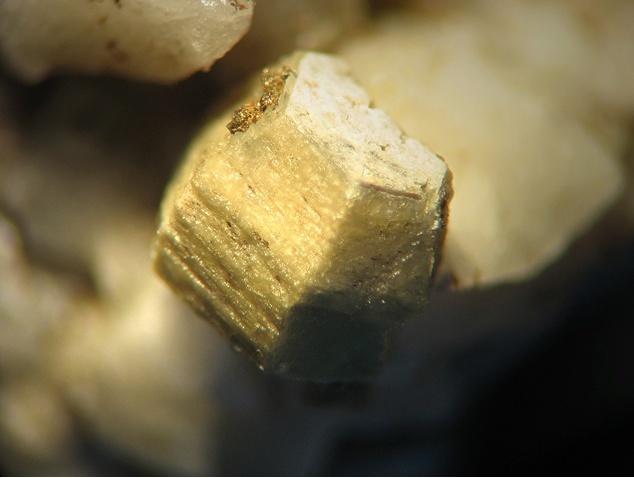 Donnayite-(Y): Mineral information, data and localities. Named in 1978 by Chao et al. 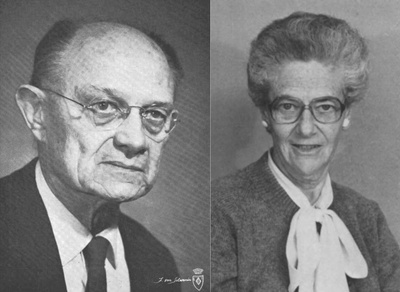 in honor of Joseph Désiré Hubert Donnay (6 June 1902, Oreye, Liège province, Belgium - 8 August 1994, Mont Saint Hilaire, Quebec, Canada), Professor of Mineralogy and Crystallography, Johns Hopkins University, Baltimore, U.S.A. and his wife Gabrielle (Gai) Donnay-Hamburger (1920, Landeshut, Silesi, Germany (now Poland) - 4 April 1987, Mont St. Hilaire, Quebec, Canada), Professor of Crystallography, McGill University, Montréal, Canada, for their significant contributions to crystallography. He was awarded the 1971 Roebling medal. She is known for solving the complex structure of tourmaline, and later solved numerous other structures. Two polytypes are known, donnayite-(Y)-1A and donnayite-(Y)-3R. The UM1992-05-CO:CaCeLaNaSr phase, although suggested to be polymorphous with donnayite-(Y), slightly differs in terms of chemistry. Platy, tabular, columnar, saucer-shaped, barrel-shaped to irregularly granular. Crystals to 2 mm. Pegmatite dykes, miarolitic cavities and interstices in nepheline syenite. Chao, G.Y., Mainwaring, P.R., and Baker, J. (1978) Donnayite, NaCaSr3Y(CO3)6•3H2O, a new mineral from Mont St Hilaire, Québec. 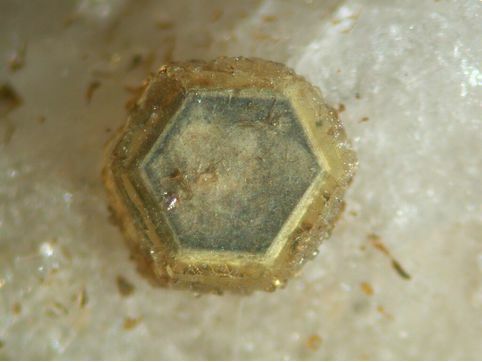 Canadian Mineralogist: 16: 335-340. Ewaldite 31 photos of Donnayite-(Y) associated with Ewaldite on mindat.org. Pyrite 17 photos of Donnayite-(Y) associated with Pyrite on mindat.org. Calcite 16 photos of Donnayite-(Y) associated with Calcite on mindat.org. Kamphaugite-(Y) 4 photos of Donnayite-(Y) associated with Kamphaugite-(Y) on mindat.org. Albite 3 photos of Donnayite-(Y) associated with Albite on mindat.org. Microcline 2 photos of Donnayite-(Y) associated with Microcline on mindat.org. Siderite 2 photos of Donnayite-(Y) associated with Siderite on mindat.org. Decrespignyite-(Y) 2 photos of Donnayite-(Y) associated with Decrespignyite-(Y) on mindat.org. Bastnäsite-(La) 2 photos of Donnayite-(Y) associated with Bastnäsite-(La) on mindat.org. 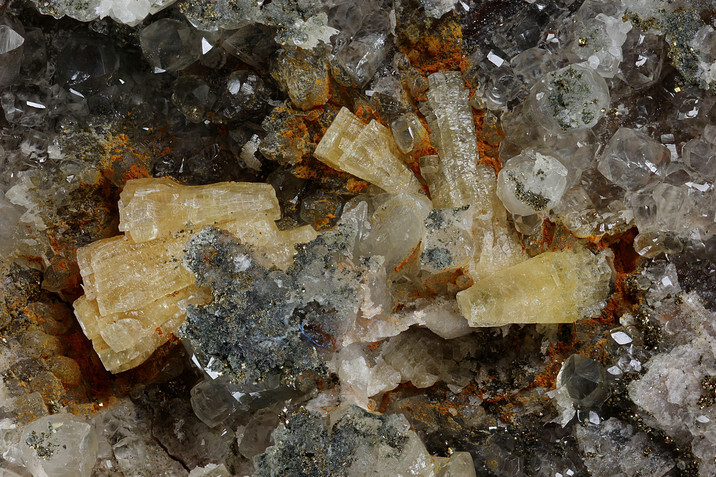 Mckelveyite-(Y) 1 photo of Donnayite-(Y) associated with Mckelveyite-(Y) on mindat.org. 15.3.4.3 Mckelveyite-(Nd) (Ba,Sr)(Nd,Ce,La)(CO3)2 · 4-10H2O Tric. Trinh, T.L.T., Pobedimskaya, E.A., Nadezhina, T.N., and Khomyakov, A.P. (1984) The crystal structures of alkaline carbonates; barentsite, bonshtedtite and donnayite. Acta Crystallographica, A40 (Supplement), C257 (abstract). Chao, G.Y., Mainwaring, P.R., Baker, J. (1978), Donnayite, NaCaSr3Y(CO3)6 73H2O, a new mineral from Mont St-Hilaire, Quebec. Canadian Mineralogist: 16: 335-340. Zaitsev, A.N., Wall, F., Le Bas, M.J. (1998): REE-Sr-Ba minerals from the Khibina carbonatites, Kola peninsula, Russia: their mineralogy, paragenesis and evolution. Mineralogical Magazine, 62, 225-250; Yakovenchuk, V.N., Ivanyuk, G.Yu., Pakhomovsky, Ya.A., Men'shikov, Yu.P. (2005): Khibiny. Laplandia Minerals Ltd. (in association with the Mineralogical Society of Great Britain and Ireland), Apatity, 468 pp. - Khomyakov, A. P. (1995): Mineralogy of hyperagpaitic alkaline rocks. Clarendon Press, Oxford, 223 pp.